Kathy Bransfield's necklace reflects the special lifelong bond between mother and daughter. It's possible to live happily with half a heart—when the other half is held by your daughter. 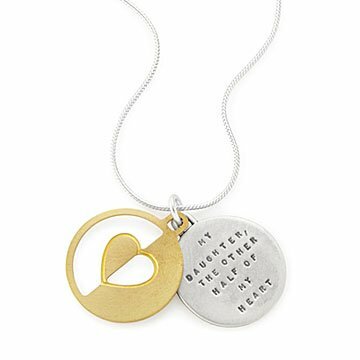 This sweet necklace by Kathy Bransfield reflects that special lifelong bond with the inspiring message "My daughter, the other half of my heart." Etched on a sterling silver pendant, the quotation is overlaid with a 22 kt gold-plated brass heart window. It's a heartfelt gift for a daughter's birthday, graduation, or going away celebration. Handmade in California. I thought the chain could be longer or include an extender. Anyone looking for a beautiful and quality gift will love this!!!! Gifts today all look the same to me.To find a unique and beautiful gift that speaks to the heart is difficult. That is why the My Daughter, My Heart necklace will always remind my only child that near or far, she is the dearest person in my life. Just because she is 50, doesn't mean she isn't still my baby. The women in my family are brilliant, accomplished and unique. Your products reflect their spirit. Thank you. I wanted my daughter to have a tangible way of knowing that I'm always here for her. All she has to do is look at the pendant. It's a beautiful, meaningful gift! My daughter and I were both touched and pleased. It was a unique and significant product to give to my daughter.